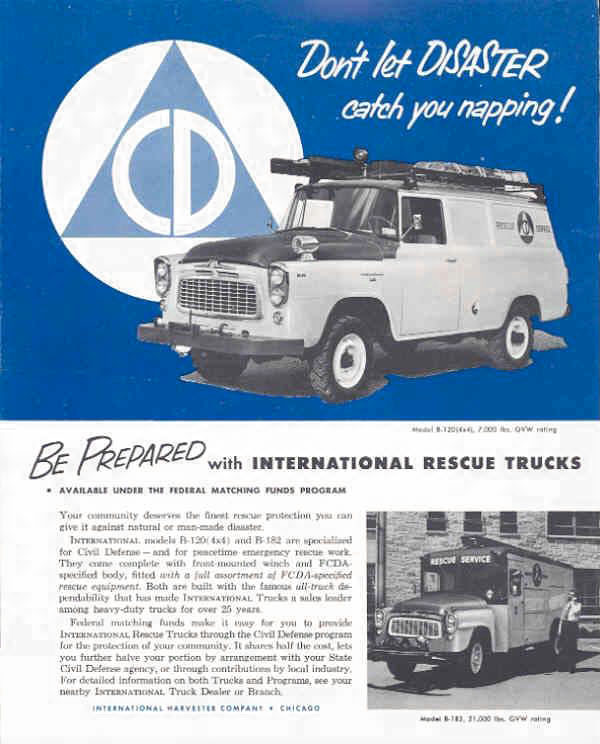 I always thought that the U.S. Federal Civil Defense Administration (FCDA) probably had a lot of Jeeps in its fleet of vehicles in the 1950s, standing by to provide help to civilians in case of natural disaster or nuclear attack. But I never seemed to see pictures that would confirm this. 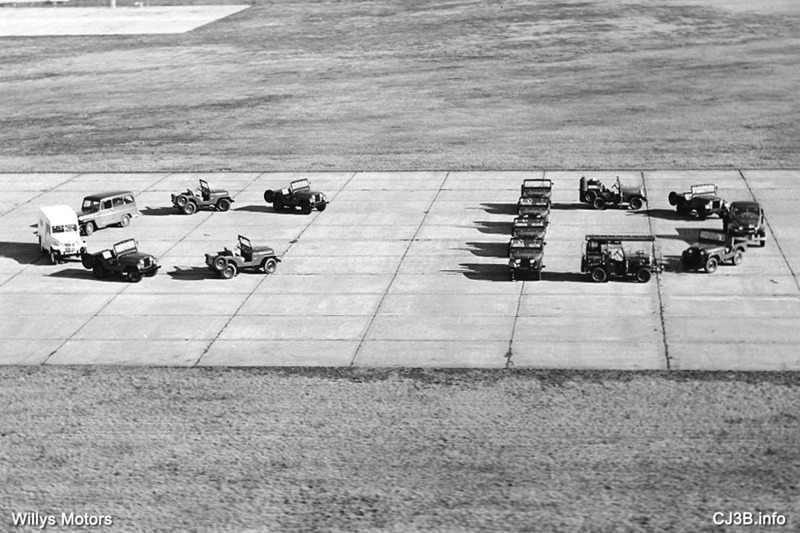 Finally I ran across this Willys photo, showing fifteen vehicles lined up to form the letters "CD". 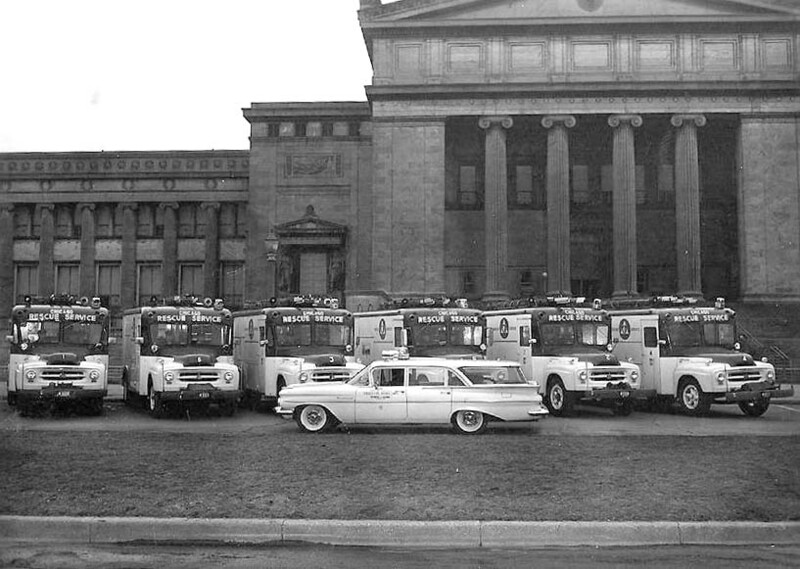 Ten CJ-5s plus a station wagon, ambulance, pickup truck, CJ-5 crash truck and CJ-3B fire engine, just before their delivery to Civil Defense in early 1955 for "Operation Cue." It seemed like an odd fleet for protecting people -- only three emergency vehicles? And they weren't going to local CD organizations, but to Operation Cue, a project at the Nevada site where atomic bombs were being tested! 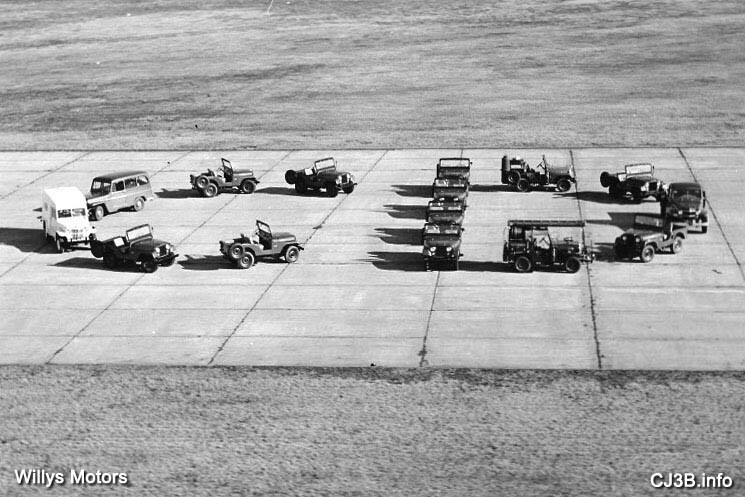 Well, it's pretty clear that Willys donated these Jeeps, since they received a "public service award" from the FCDA in Spring 1955 for their contribution to the atomic test program. The certificate was published soon after in a brochure for the new Willys rescue truck (350K JPEG). The full caption on the back of the photo reads, "For Release Wednesday, March 30, 1955. 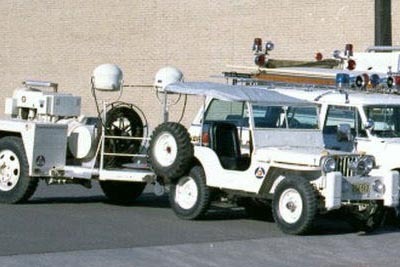 The 4-wheeel drive emergency vehicles which will be used in the Civil Defense phase of 'Operation Cue' at the Nevada atomic test site form CD's initials before shipment from the Willys plant in Toledo. Specially equipped for fire-fighting, rescue and other emergency duties, the vehicles will be manned by CD workers in simulated disaster exercises following the blast in the 'test tube' town built for the detonation. 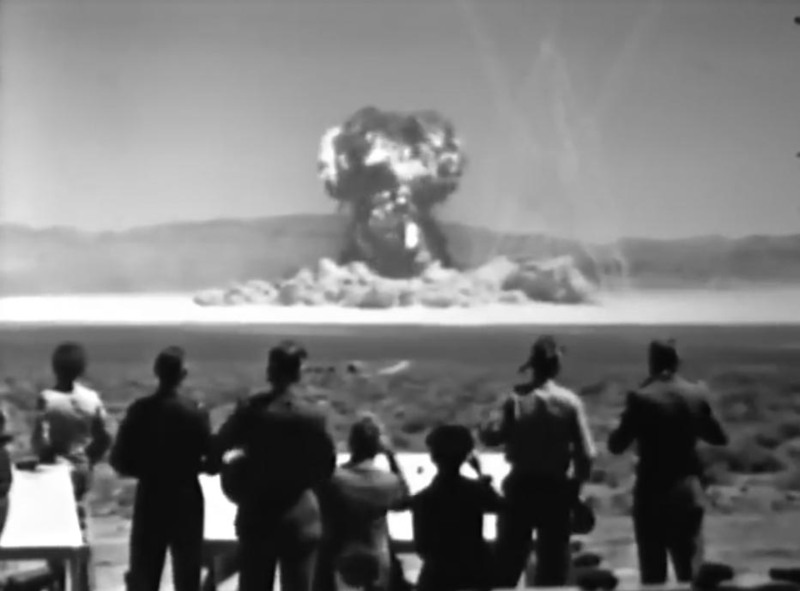 The CD phase of the current series of Nevada atomic tests will take place in April." A quick search for photos of any of these Jeeps in action didn't produce any results. 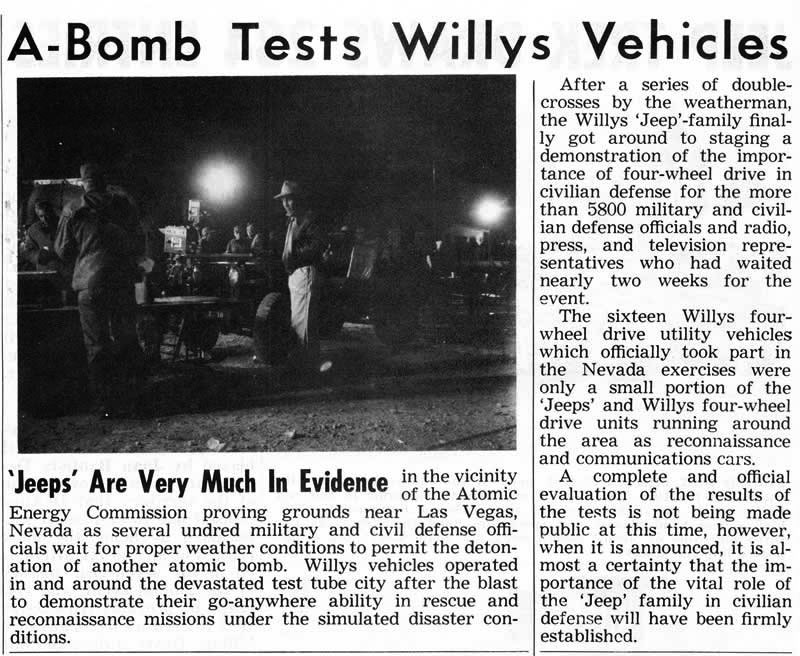 An article from Willys News (160K JPEG) posted at eWillys.com mentions that there were sixteen Willys vehicles officially taking part in the "A-bomb tests," and many other Jeeps on hand, but has no details on what they may have been used for. 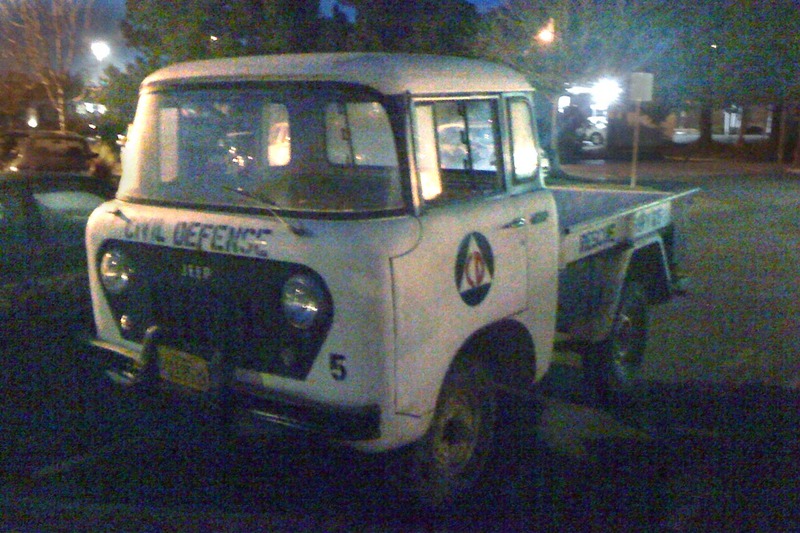 A nighttime photo shows only what looks like an Army M38 in the background. 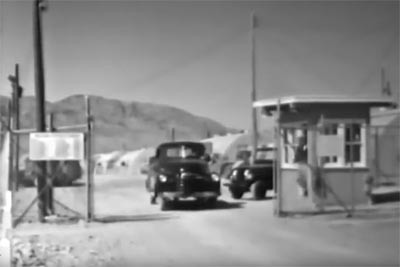 The film gets off to a good start when I spot what looks like it could be one of the CD Willys CJ-5s, at a Nevada Test Site entry gate. 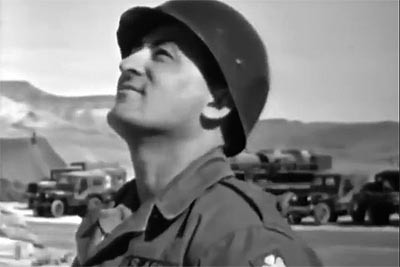 Some Army Jeeps are visible in the background of this shot of an officer of the Fourth Army (1927-1971), headquartered at the time in Fort Sam Houston, Texas. 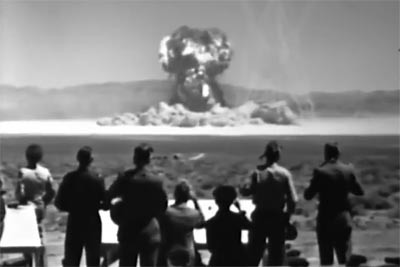 Operation Teapot included underground and aerial explosions, as well as tests such as this one where the nuclear device was mounted on a tower. My jaw dropped for a second when I saw Jeeps placed in the vicinity of blasts, to test the extent of the damage. 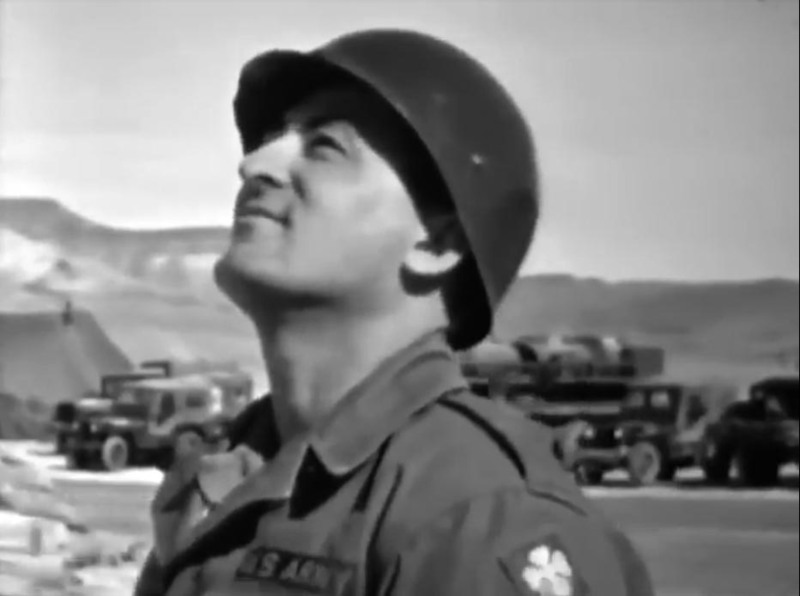 Surely this wasn't the fate of those shiny new vehicles from Willys! Then I realized these appeared to be older M38A1s. 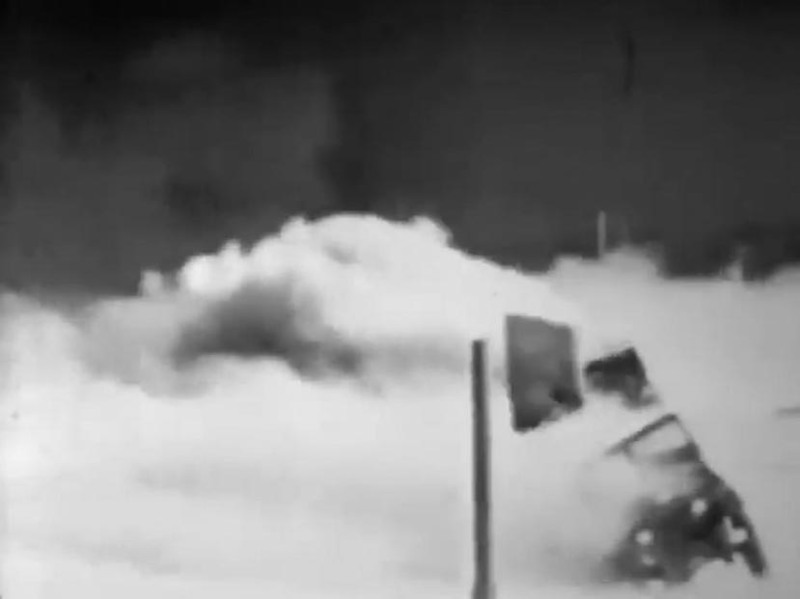 As the Jeep in the foreground is flipped over by the initial shock wave, the hood goes flying off to the left. 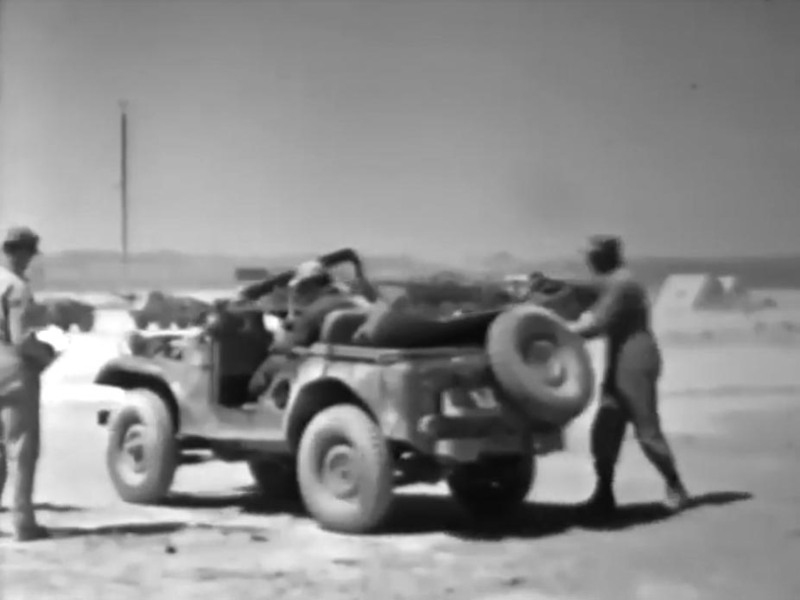 After one test, a Jeep is rolled away with its hood in the back. In other blasts, M38A1s and MBs were turned into nothing more than mangled wreckage. 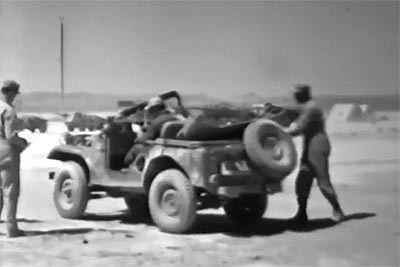 But none of the CD Jeeps were to be seen in the film, which is on YouTube. 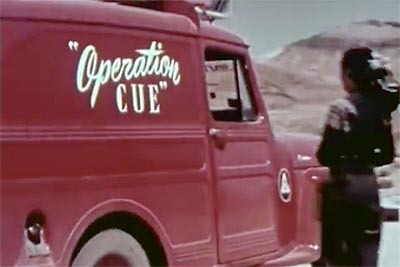 There is another short 1955 film produced by the FCDA about Operation Cue itself, with a promising opening which shows a red Willys panel delivery truck with a Civil Defense logo (40K JPEG) and carrying a floodlight tower on a roof platform. I suspect the floodlights were primarily for the use of the filmmakers, and this is not one of the vehicles in the "CD" group photo above. 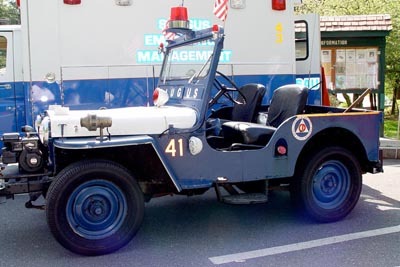 But could this have been the last of the sixteen vehicles mentioned in Willys News , maybe unavailable for the big photo because it was out having the lights installed? 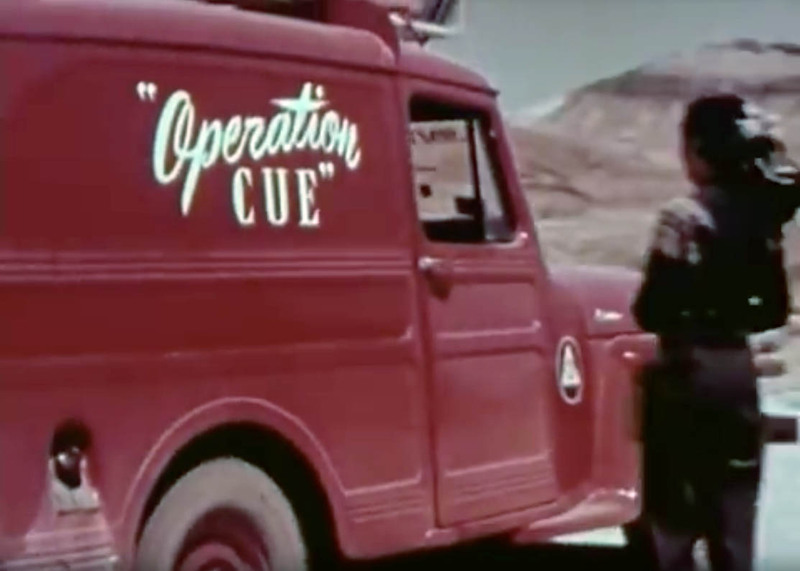 As "reporter" June Cowan is introduced, the panel truck drives past her, showing off graphics which make "Operation Cue" look more like a neighborhood business in a Willys ad, than a classified government test program. The rear of the truck has a substantial support framework for the roof platform, neatly built into the bodywork. And the sequence in the film looks like a carefully planned bit of product placement. 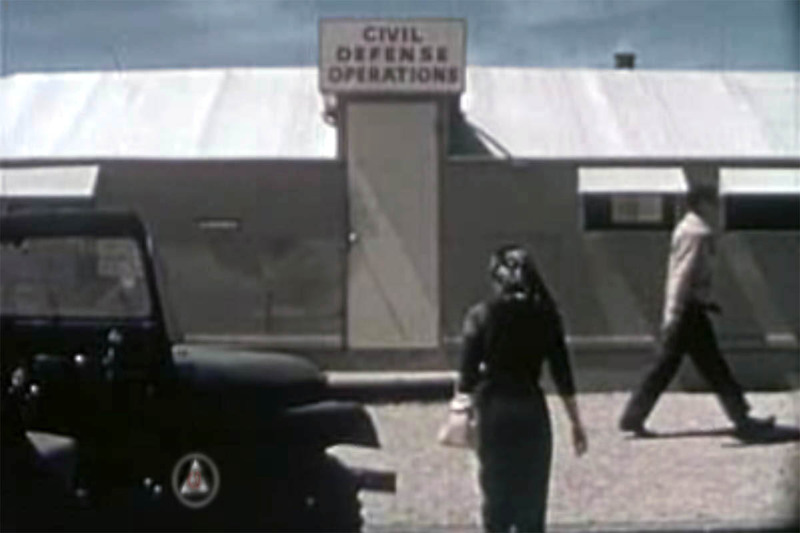 When the reporter heads into the Civil Defense offices at the site, we get a glimpse of one of the CD CJ-5s. 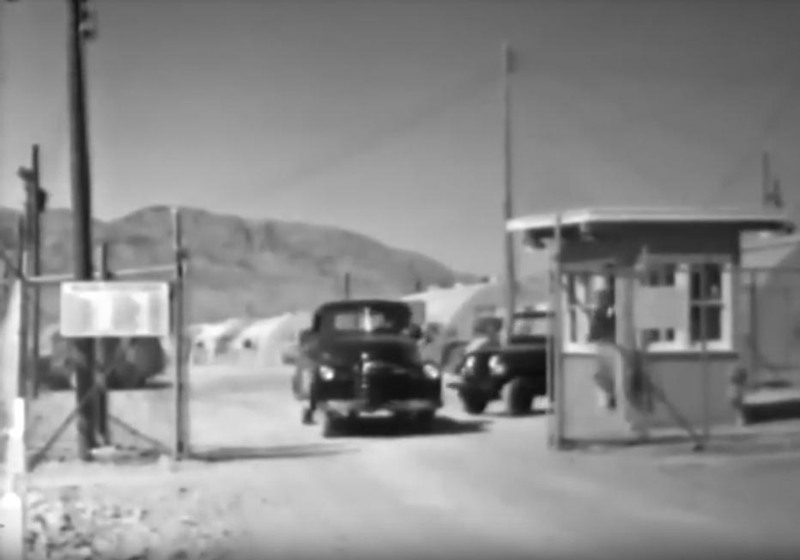 But after that there are no Jeeps around, as we see the preparations for testing the effects of a nuclear explosion on a mock-up of a small American town. Houses and other buildings are constructed and furnished at specific distances from the blast location. Mannequins in various types of clothing are placed inside and outside, and even in concrete bomb shelters built inside the houses. There are plenty of cars driving around the test site, which is smooth and flat. 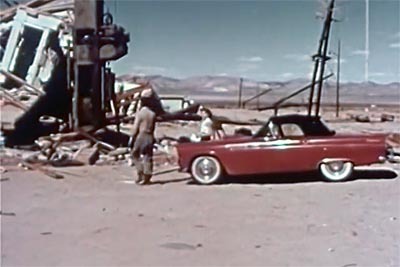 When the intrepid reporter is brought in to survey the damage after the blast, she's ferried not in a Jeep but in a Thunderbird convertible. 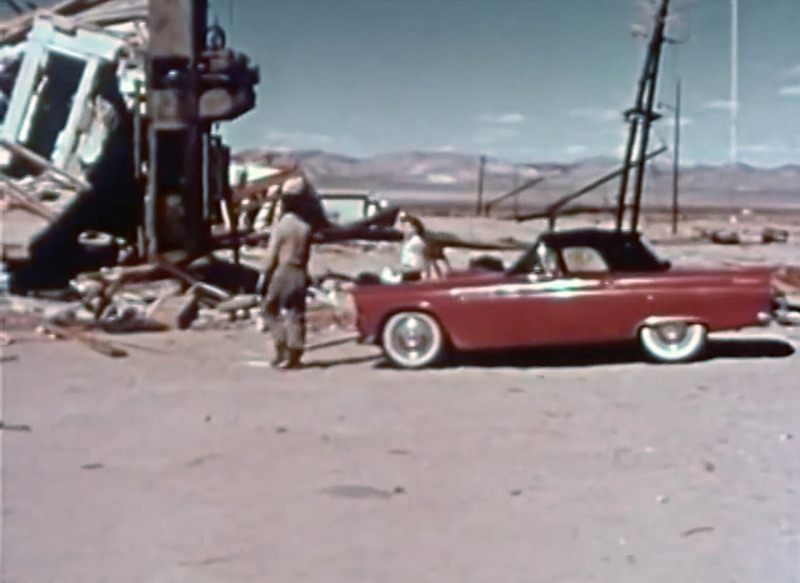 No evidence here that Jeeps were essential to nuclear testing or defense! This film is also on YouTube. 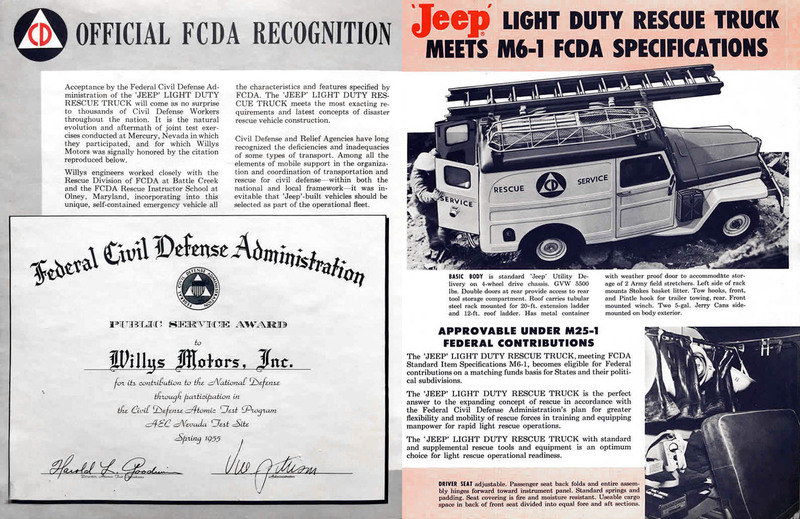 Maybe Willys was so happy with the connection they had made with the FCDA, that they weren't aware the agency didn't actually have much need for Jeeps. 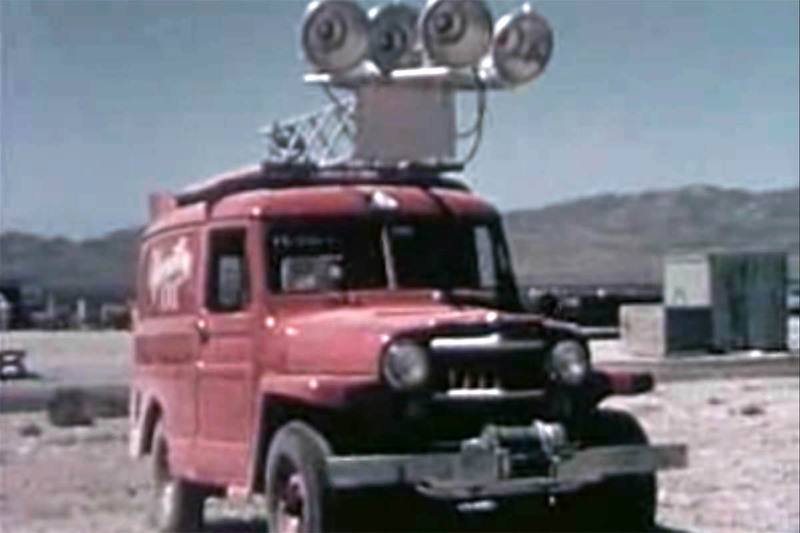 For the 1956 model year they built a variation of their 4x4 panel delivery truck as a light rescue vehicle, meeting "FCDA Standard Item Specifications M6-1" (350K JPEG). A small rescue squad with equipment to deal with incidents such as a car accident or high-angle rescue, would have limited usefulness in a large-scale disaster or attack, so Willys found these trucks a difficult sell. There was also limited federal money allocated to the FCDA, which expected state and local agenices to recruit volunteers and provide much of the funding to purchase equipment. So many small towns could not afford these fancy little trucks. Among the specifications from the FCDA was a standard blue over white paint scheme. 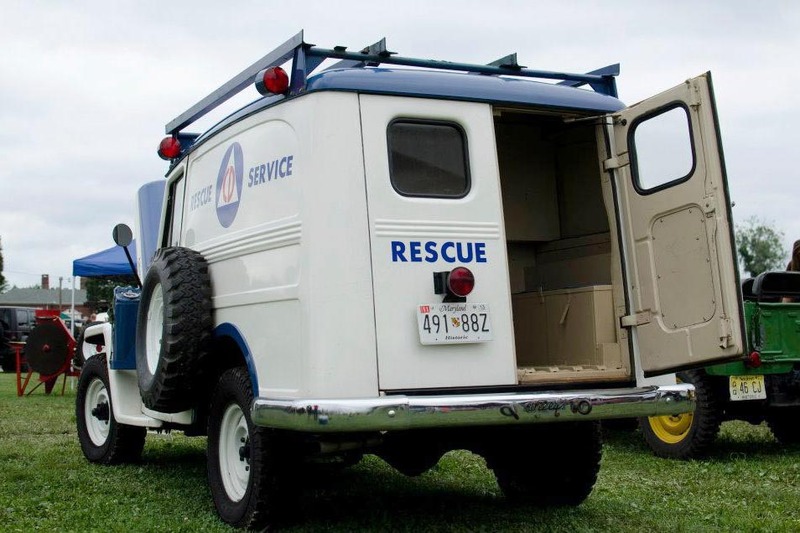 Two of the fourteen Light Rescue Trucks known to have been built by Willys, have been restored. This one was photographed in 2012 by geepstir on Flickr. 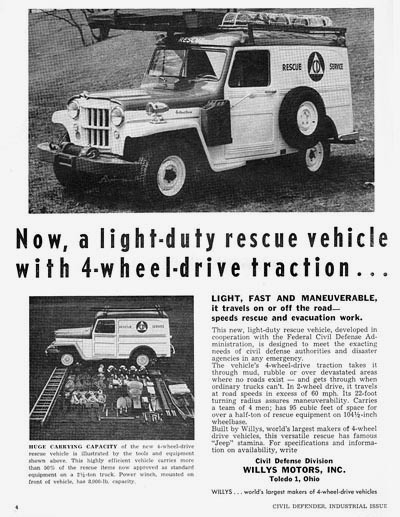 See more details on the Willys Light Duty Rescue Truck on CJ3B.info. 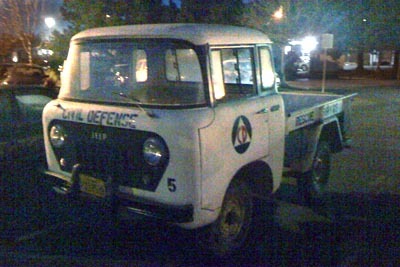 Adding to Willys' difficulty in selling these trucks was the fact that other firms were competing for the same market. Truck makers such as GMC, International and REO, and body manufacturers like Boyerstown and Gerstenlager (150K JPEG) were also building larger heavy rescue trucks, quite of few of which still survive 60 years later. The big trucks were nicknamed "Calamity Janes" after the legendary American frontierswoman. I have seen reports suggesting that the FDAC ordered 1,300 of the heavy trucks for deployment in larger cities, not to mention 3,500 of the smaller panel trucks. See a lineup of Calamity Janes (90K JPEG) in Chicago -- these are earlier International models. 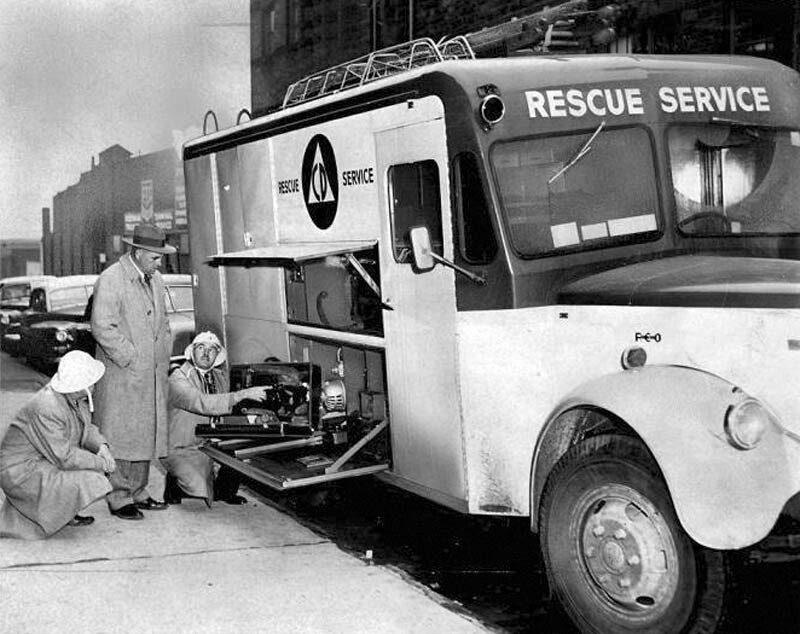 According to a report in the Detroit News of 3 January 1953, the federal government paid half of the $13,000 for this REO truck. 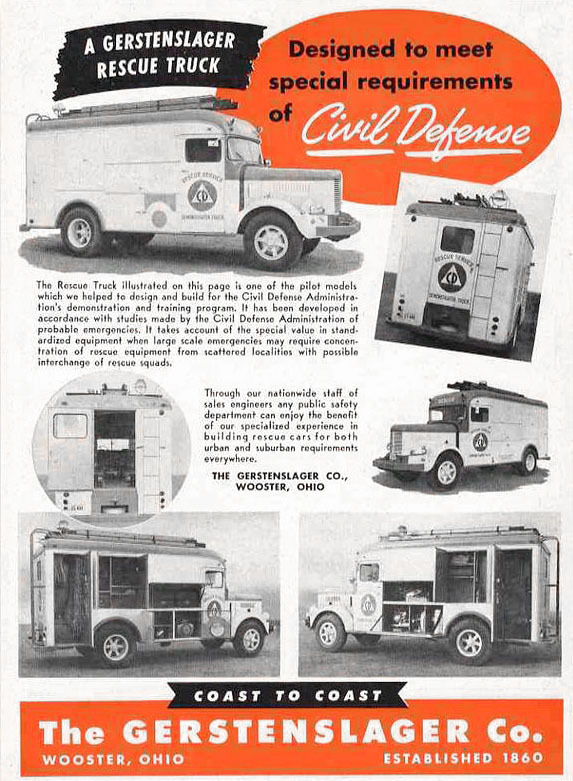 The caption also says, "Detroit's first civil defense rescue truck, designed by national defense authorities, was delivered Friday. Inspecting the vehicle's equipment are Brig-Gen. Clyde E. Dougherty, the city's civil defense director (center), and Philip Linebaugh and Frank Blanchard (pointing), rescue team captains. The truck is the first of three to be delivered." Detroit News photo by H. Burgert, courtesy Minnesota Historical Society. 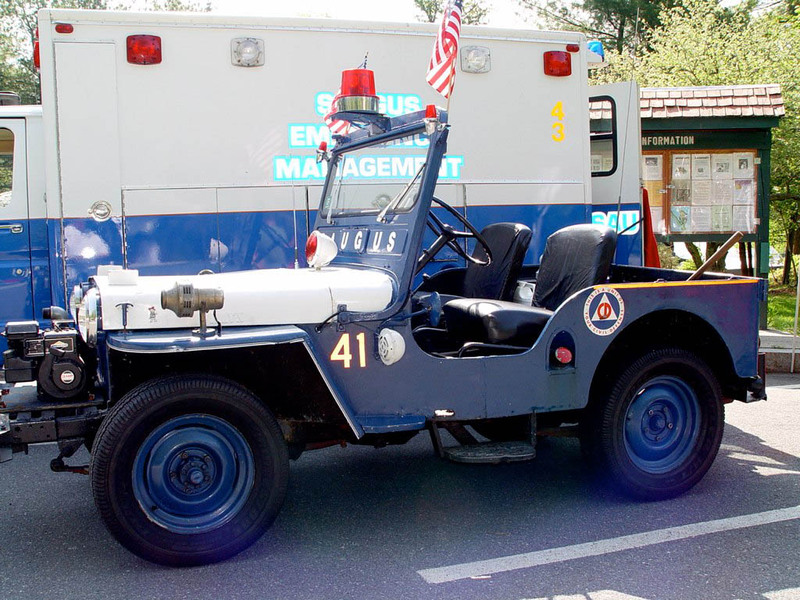 So here are the examples I have run across of Jeeps that were actually used by CD agencies (usually fire departments.) 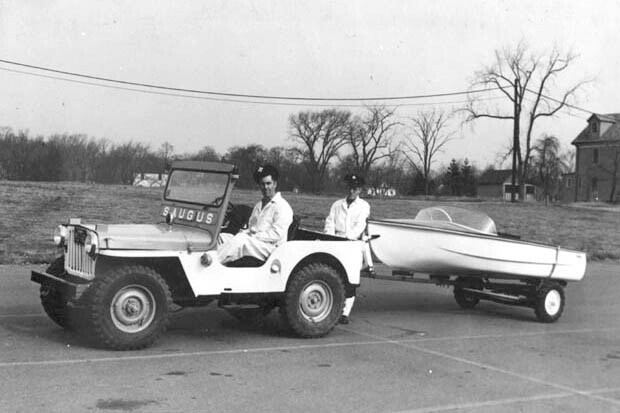 Some of them are military surplus units, available to local authorities at little or no cost, including this former U.S. Navy CJ-3A appropriately being used to pull a rescue boat, in Saugus, Massachusetts in 1957. By 1959 (50K JPEG) a front pump had been added. 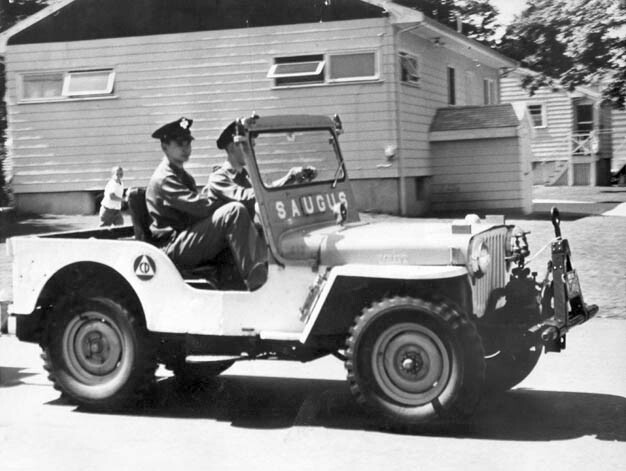 Photos courtesy Town of Saugus. The same 3A was photographed in 2009, by which time it had received a new paint job with the white and blue mostly reversed. 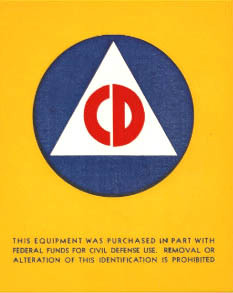 Local CD organizations often used their own variations on the FCDA blue and white paint. 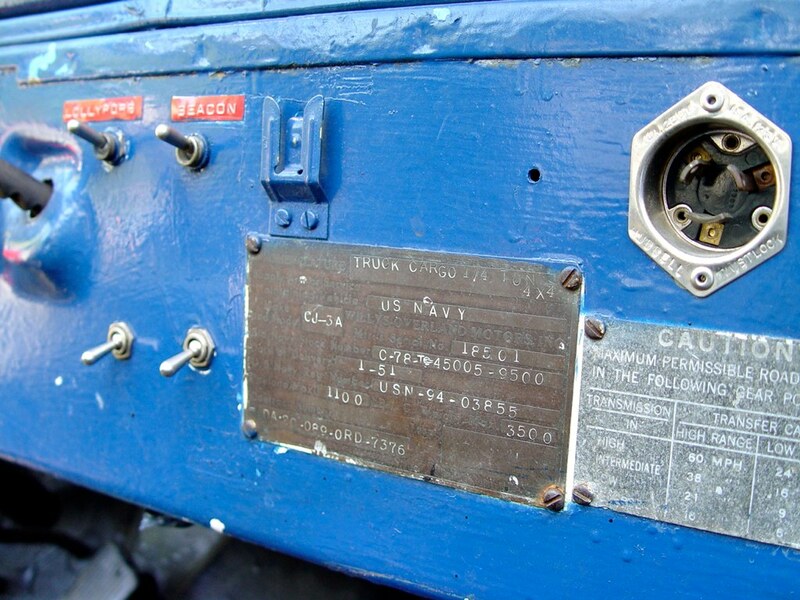 See also the original Navy nomenclature plate (200K JPEG). Photos by Flickrfan6. 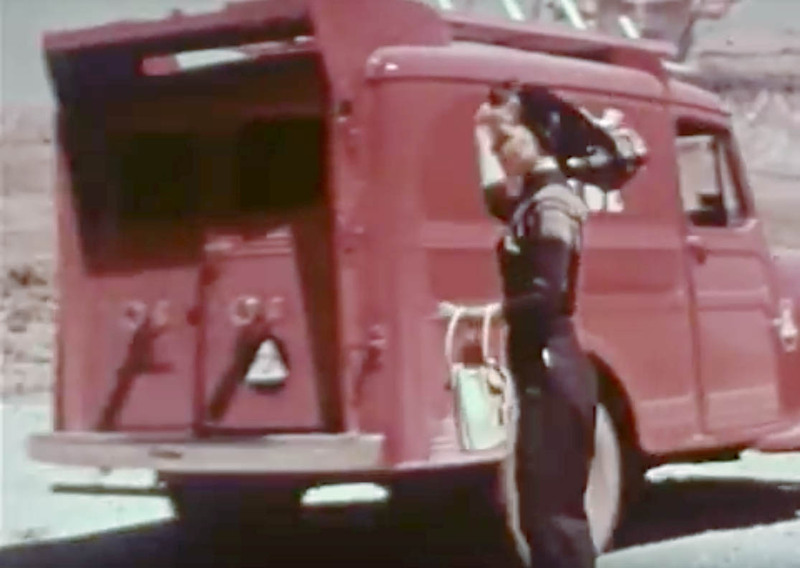 Fire departments frequently painted CD units in their standard red or white. 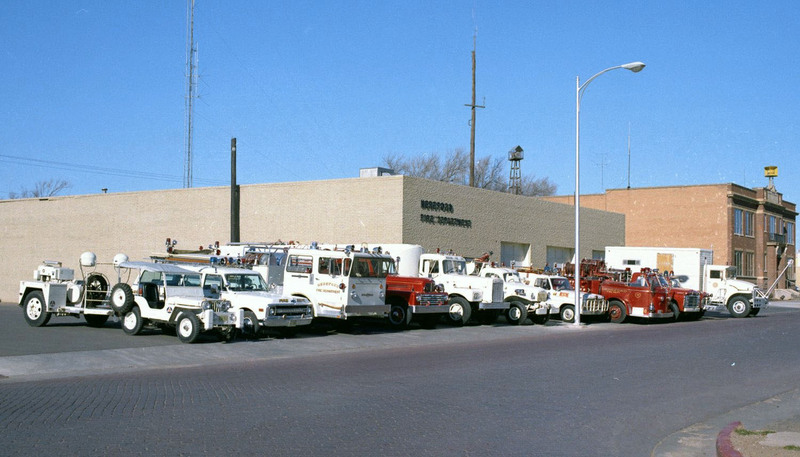 The Hereford, Texas VFD still had this CJ-2A and some WWII surplus trucks in a 1971 photo of their apparatus (200K JPEG). 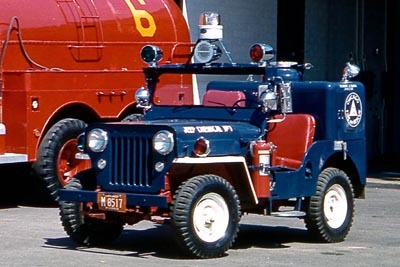 The Jeep was pulling a floodlight/generator trailer, and was given a prominent spot in the photo, right next to the Chief's new 1970 Suburban and a 1970 American-LaFrance pumper. 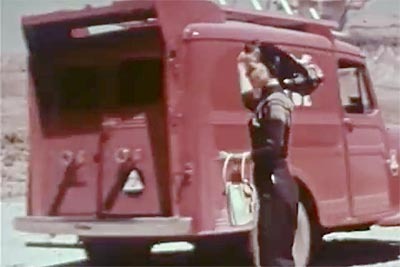 The Hereford apparatus carried red and blue flashers. Photo by Bill Bradly, courtesy of Deaf Smith County Library and Texas History. 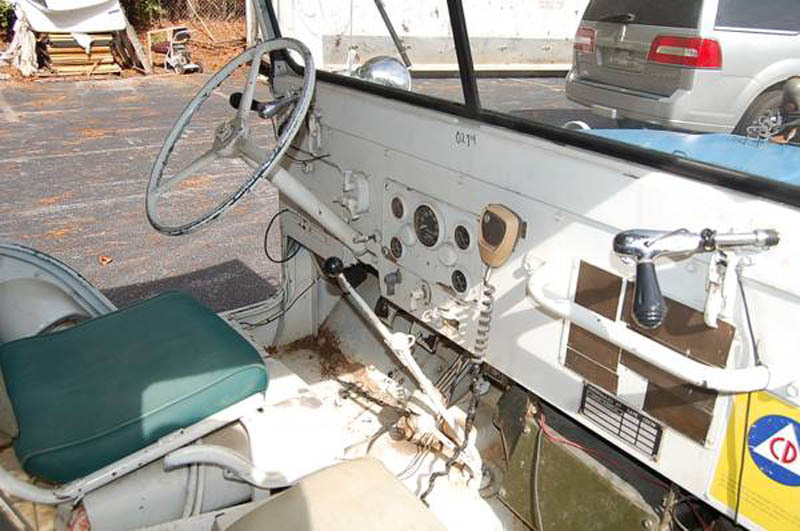 This military surplus 1953 M38A1 spotted for sale online had apparently been in service in the Atlanta area. A photo of the dashboard (90K JPEG) shows the yellow Civil Defense equipment label. Photos via eWillys.com. 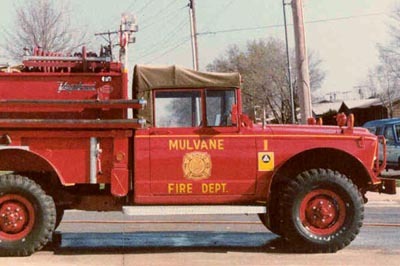 That equipment label (20K JPEG) recognizing federal funding assistance was also sometimes applied to the exterior, as on this surplus 1968 Kaiser M715 in Mulvane, Kansas. 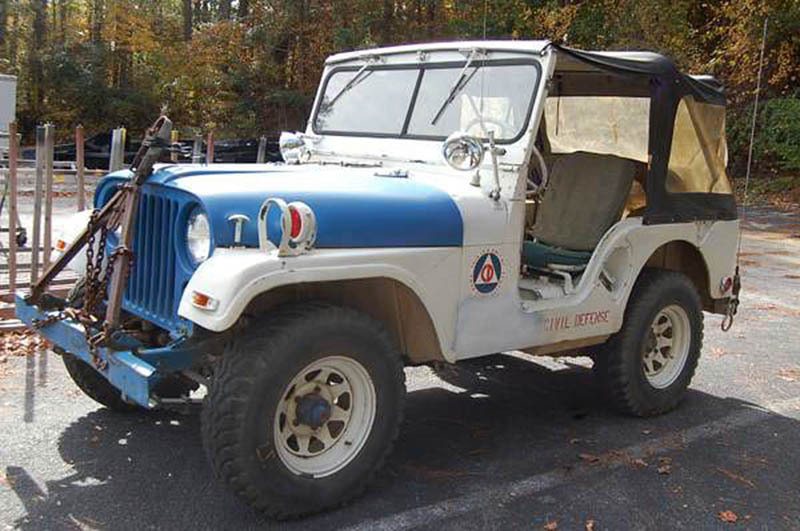 "Civil Defense Jeep #1" was later renamed Jeep 402, and was sold at auction in 1987. 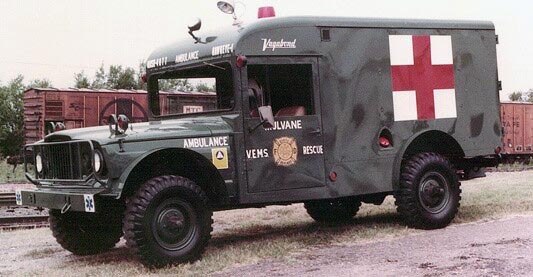 Mulvane also had an M725 ambulance (60K JPEG). Photos courtesy Mulvane Emergency Services. 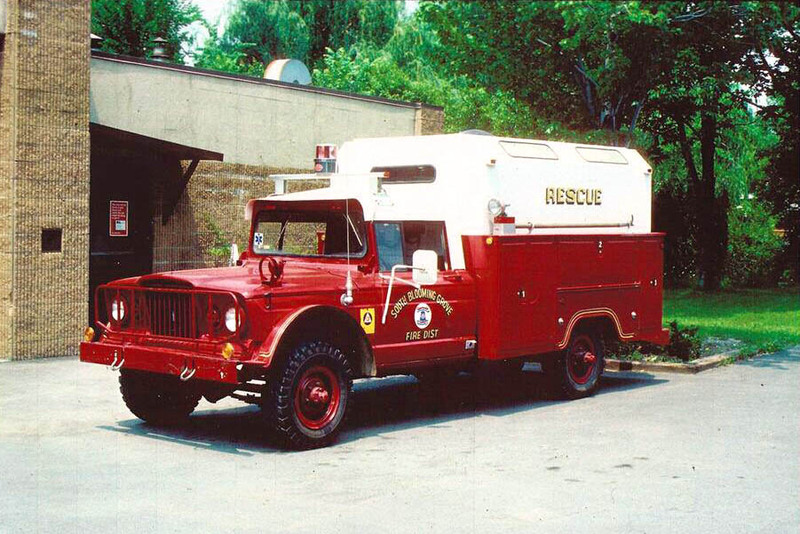 The many M715s sent to fire departments after the end of their military careers were used mostly as mini-pumpers and brushfire trucks, but this one was converted into a CD rescue unit for South Blooming Grove Fire District, just north of New York City. Even an FC150 may have found its way into a CD fleet in California. The stencilling (200K JPEG) in these 2011 photos certainly isn't original, but the truck does have old government plates. Photos from Tamerlane's Thoughts. It seems that big cities were the ones that could afford brand new CD vehicles. 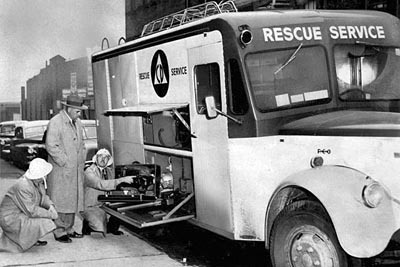 The Chicago Fire Department bought this 1961 Ansul dry chemical crash unit for O'Hare Airport, apparently with the assistance of Civil Defense funding. This is a detail from a photo by Warren Redick, courtesy of Steve Redick at KSC711. 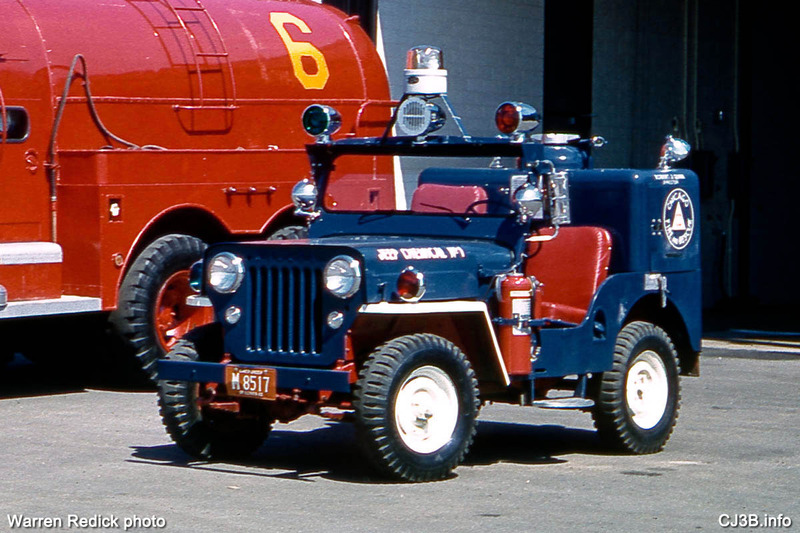 See the full photo and more details on this CJ-3B in Ansul Chemical Crash Trucks on CJ3B.info. 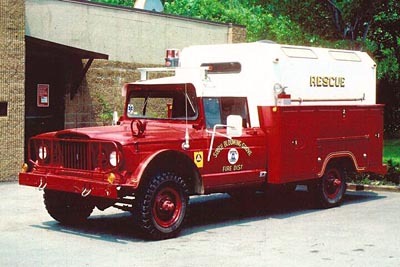 So, despite the fact that Willys offered the CJ-3B as its budget 4WD fleet option through the late 1950s and early 1960s, a couple of fire truck conversions are the only examples I have found of Civil Defense CJ-3Bs. And apparently there weren't a whole lot of other CD Jeeps either. More photos are welcome. 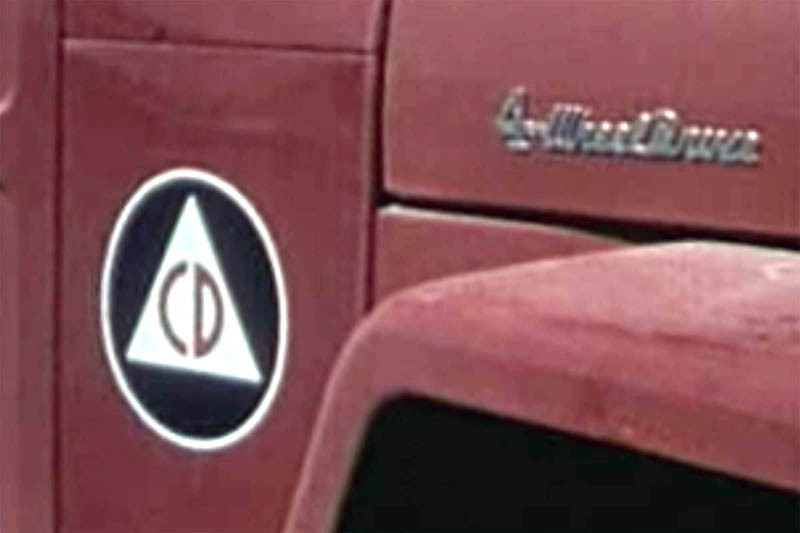 See information on CD geiger counters carried by a Valley Fire Truck on CJ3B.info. 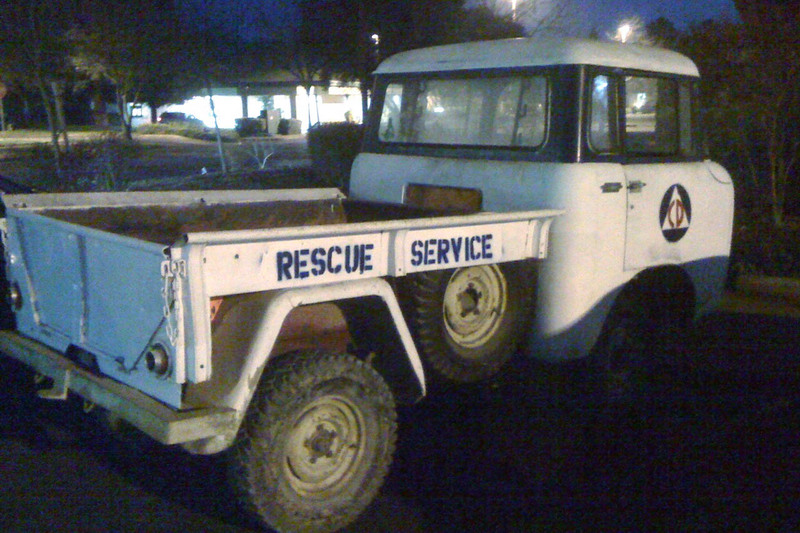 See also details of the Willys Light Duty Rescue Truck .